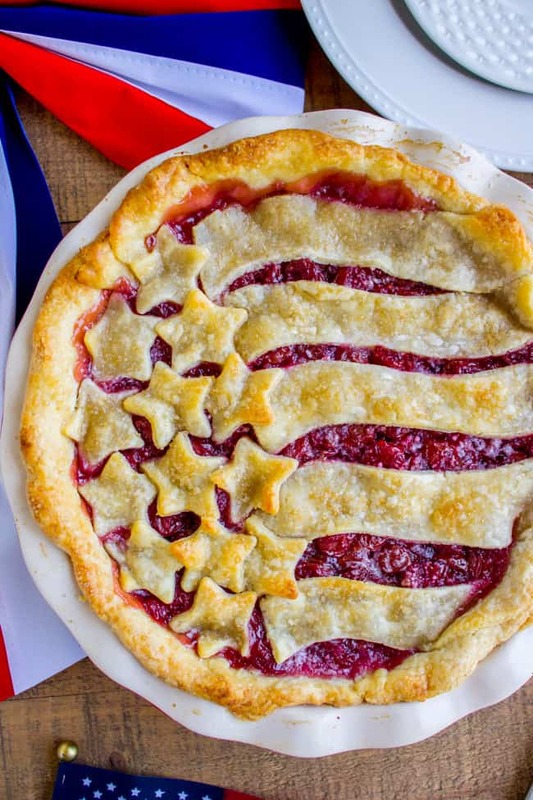 Cherry pie with the stars and stripes is the perfect dessert to bring for your 4th of July barbecue! 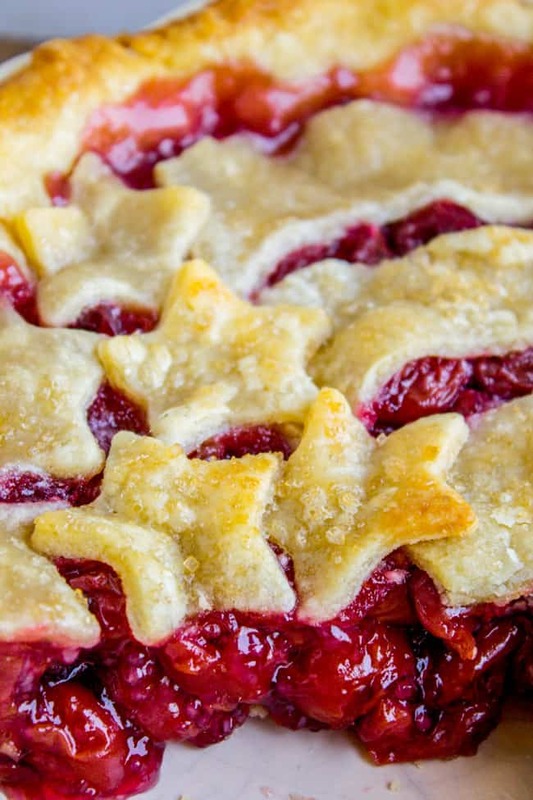 It’s a lot easier than it looks, especially since this pie is made from (shh) canned tart cherries! It’s SO delicious with a scoop of ice cream. Oh what a beautiful mooooorning! Oh what a beautiful daaaaay! Who knows that song from “Oklahoma”? It’s a classic right? Here’s something shameful: I’ve never seen it. I know the song because there is a preview for it on the double VHS tape of Sound of Music that we had growing up (that I watched all.the.time). But it’s such a great song and is just how I’m feeling this morning. Much of this has to do with the fact that my windows are open and the 110 degree weather of last week seems to have passed. HALLELUJAH! Good feels also might be from the fact that I bought a bunting this week and nailed it to the fence out front. If I had heard myself say that sentence a few years ago I would have had no idea what I was talking about. I’m not much one for decorating and I feel like bunting is Advanced Decorating Vocabulary. But I’m all in the spirit of 4th of July this year, probably because I’ve been obsessed with listening to Hamilton since we saw it in San Francisco a few weeks ago. BRING ON THE PATRIOTISM. I AM NOT THROWIN AWAY MY SHOT. Can you guys find fresh tart cherries at your grocery store? I never see them. I feel like that’s the kind of thing you need to go to the farmer’s market for, which I should probably do sometime. But until then, canned tart cherries. They make for a delicious pie. (Just don’t use sweet cherries, those beautiful dark red Bings you see at the store. They are too sweet for pie and would be better off being placed directly in your mouth.) The best cherries for this pie are Morello cherries, you can get them at Trader Joe’s or online. The Oregon brand of tart cherries at the grocery store works fine too. Normally I would scoff at spending so much time on a pie only to use canned cherries, but I swear you guys, this pie is amazing. And anything that is this pretty is just fun to eat anyway. I promise it’s not that hard. Pies look intimidating, but they just take a bit of practice. 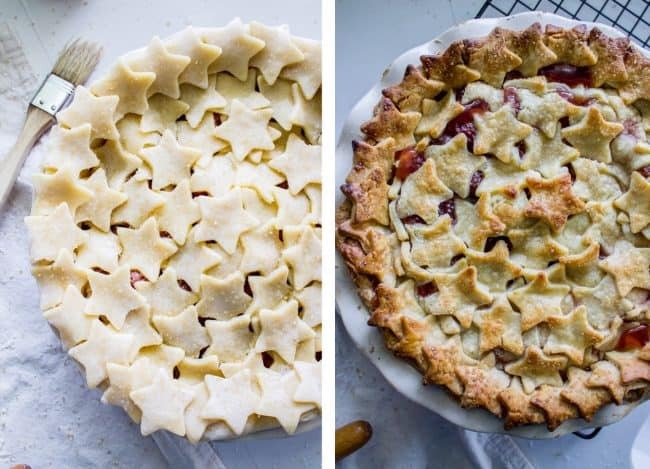 The top of this pie is actually pretty easy because you don’t even have to lift an entire pie crust, you just cut out the parts you need. Easy peasy. And all your friends will ooh and aah. I made this pie twice because I overcooked the crust the first time. It’s always such a tragedy when you spend all that time rolling out dough and then ruin it in the oven. I think part of the problem was all the jagged edges from the stars, they cooked faster. I also baked it at 400 degrees F for 50 minutes, and didn’t cover it for the first 20 minutes, so that didn’t help. If you want to try doing all stars (like the above photo), use the foil shield the entire bake time, and switch the oven temp just like it says in the recipe below. Sorry I forgot to take more detailed pictures of cutting out the top crust! If you squint your eyes you can see the swirly lines (for the stripes) from the knife I used. I used a non serrated paring knife. I cut stars from the rest of the dough using a star shaped cookie cutter. Here’s how to make the crust shield. I feel like this pie is going to outer space. Also ignore the banana peel and random glow stick. OH! I almost forgot to mention my new recipe plugin! (That’s the box below where my printable recipe shows up, for those who don’t speak Computer.) Check it out. Hopefully it will be a little easier to print the recipe now. And now a photo will show up on the page when you print! So many people have asked me for that over the years, it’s finally here! Yay! More 4th of July recipes coming later this week! Oh have a beautiful morning and a beautiful daaaaaay! 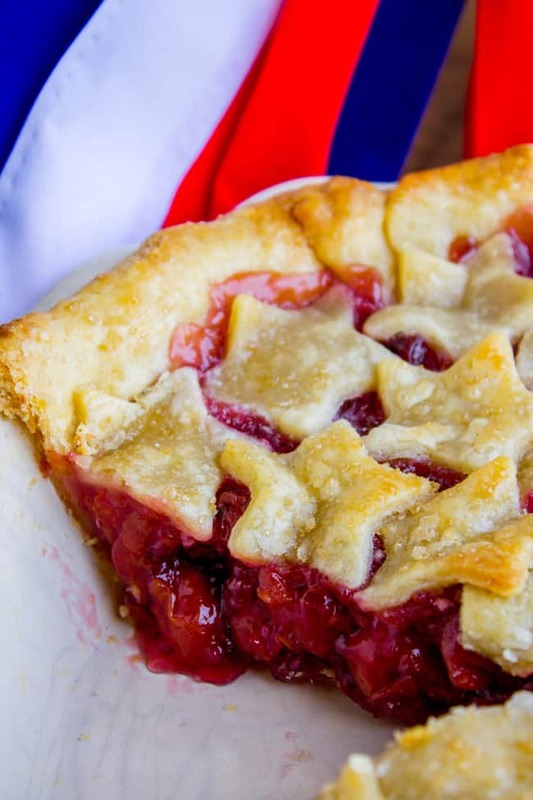 Cherry pie with the stars and stripes is the perfect dessert to bring for your 4th of July barbecue! Drain the cherries well. 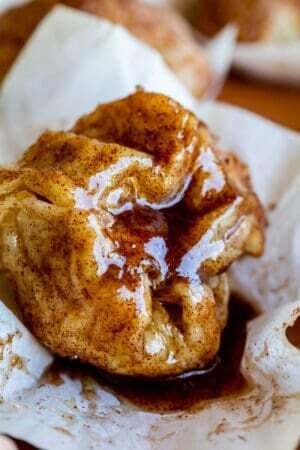 Add them to a medium size bowl and stir in sugar, salt, tapioca, almond extract, and vanilla extract. Let sit 15 minutes while you make the crust. Use a pastry cutter or fork to cut in the butter and shortening. Cut until it looks like coarse crumbs with pea-size pieces of butter. Don't overdo it! In a small bowl beat one egg. Pour out half (into the sink or into another container, or heck, into a frying pan. You can also save it to brush the crust later). You can just eyeball it. Add the half beaten egg to the cold water that you put in the freezer. Beat it together, then add it to the shortening mixture. Stir until it is just coming together, then use floured hands to knead it once or twice (only to make it come together). Divide the dough in half. Put half in the fridge. Generously sprinkle flour onto a sheet of parchment paper or pastry cloth. 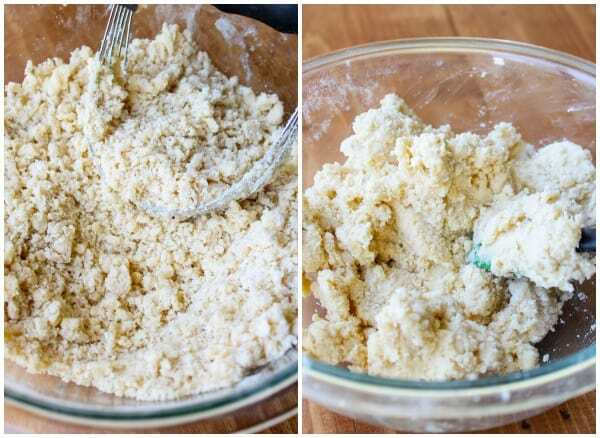 Roll the dough into a circle with a rolling pin, using as much flour as you need so that it doesn't stick. It should be about 13-14 inches across. Invert the parchment paper onto a 9-inch pie pan and gently peel off the paper. (Or roll the dough onto a rolling pin and unroll into the pan.) 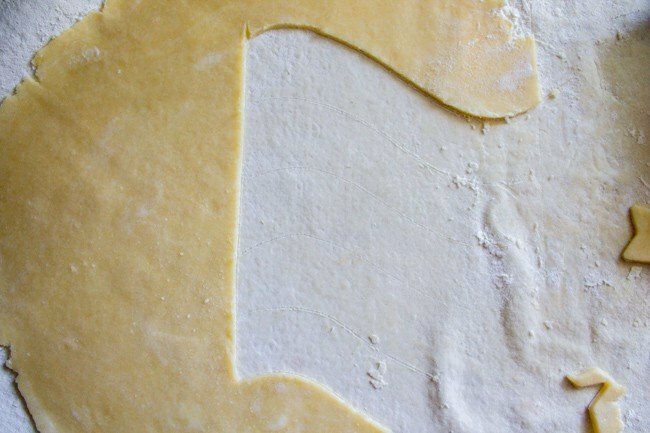 Arrange the pie crust and gently tuck the overhanging dough underneath the edges to create a crust. Pinch or crimp the edges with your thumbs or a fork. 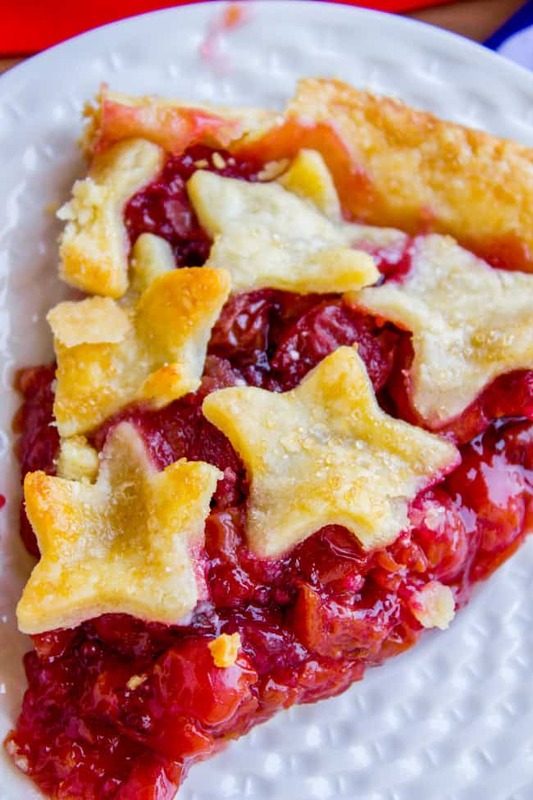 Add the cherry filling to the pie crust. 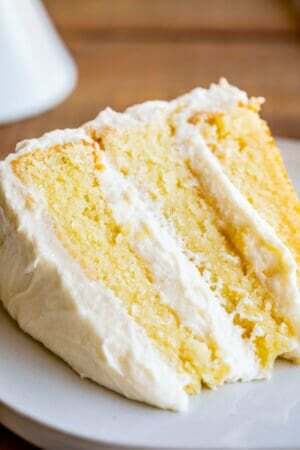 Cut 2 tablespoons of butter into chunks and sprinkle it over the top of the filling. Stick the pie in the fridge while you make the top crust. Use a a rolling pin to roll the second half of the pie dough into a (roughly) 12 inch circle. Make sure your surface is well floured! 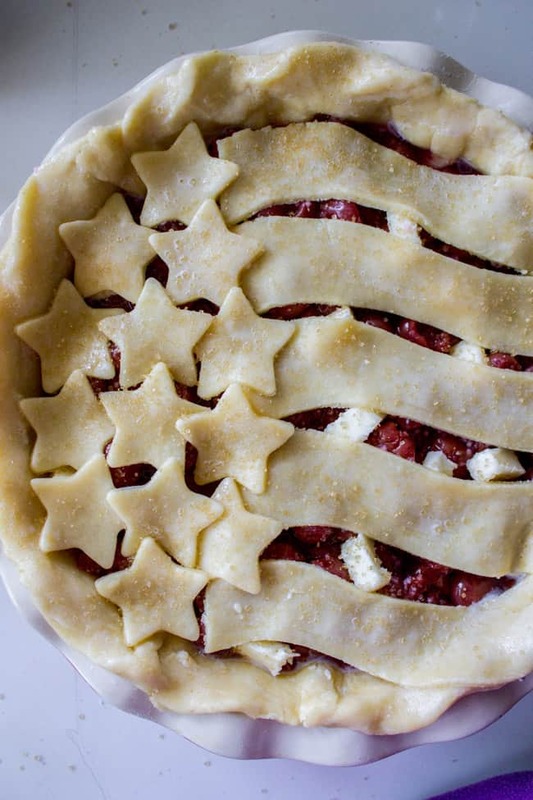 Arrange the stripes onto the pie, starting with the center stripe and moving out. Tuck into the crust. Use a pastry brush to lightly coat the top of the crust with milk. OR you can brush the crust with the leftover half-egg from the dough. Sprinkle the pie with coarse sugar. Create a crust shield by getting a square piece of aluminum foil about the size of your pie. Fold it in half, then in half again (quarters). Use scissors to cut the not-folded edges into a rounded edge. Then cut out the middle. (see photos). Unfold it and you should have a circle of foil with a hole in the middle. Place the foil over the crust of your pie and crimp it down over the edges. Place your pie in the oven; make sure to put it on a baking sheet in case it overflows. Lower the oven temperature to 375 degrees F. Bake for another 30-35 minutes (a total of about 50 minutes). The pie is done when the top and edges are golden brown. I never removed the foil. Remove the pie from the oven and let cool for about 1-3 hours before slicing. Usually after one hour a fruit pie is still liquid-y, but this one does pretty well at being sliced warm (thank you, tapioca!). You can speed this up by sticking it in the fridge or freezer. Serve with vanilla ice cream! Or cream, if you're a convert. 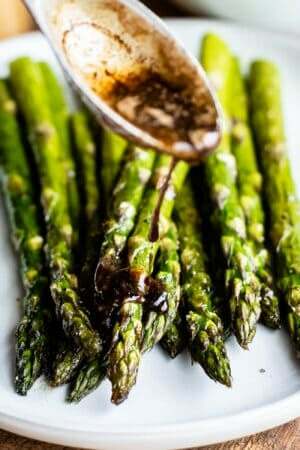 *You can use all shortening, or any combination of shortening and butter that you like. This is the combo I like. Recipe from my BFF Sarah, who adapted it from Allrecipes.com. I got the stars and stripes design idea from Land O Lakes. 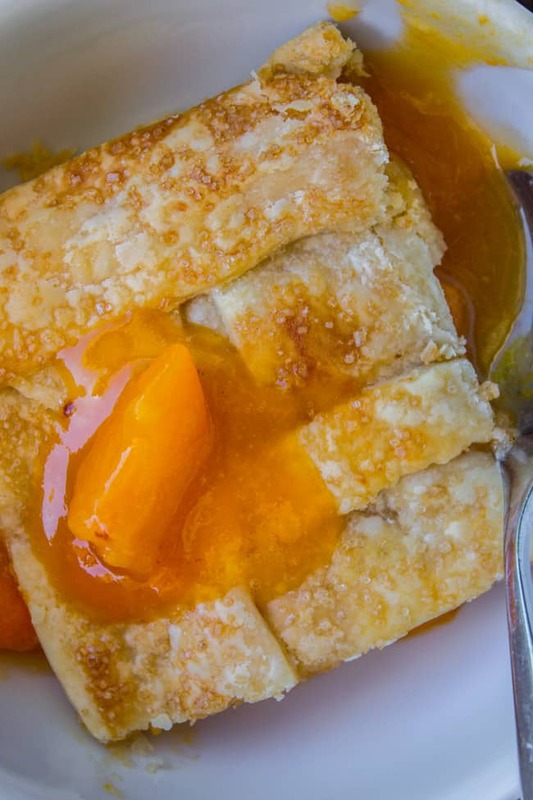 Peach Apricot Slab Pie << I just posted this last week and I’m still a little obsessed. 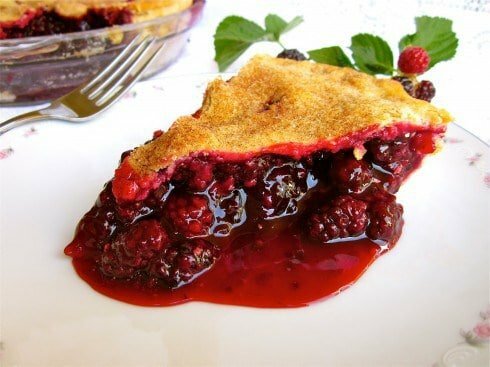 Blackberry Pie << I’ve eaten more of this pie than any other. My mom makes it for EVERY holiday. It’s the best. More cherry pie from friends! I was looking for a recipe to use morello cherries in. I already had the crust and was interested in the filling recipe. I found the recipe simple and quick enough. 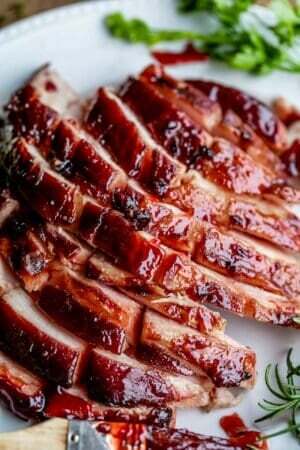 We enjoyed the flavors and the texture. Thank you for posting the recipe. I will definitely be using it again. 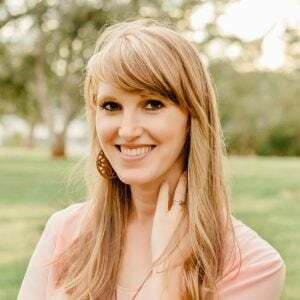 Hey Jen! I’m so glad you all liked the pie! 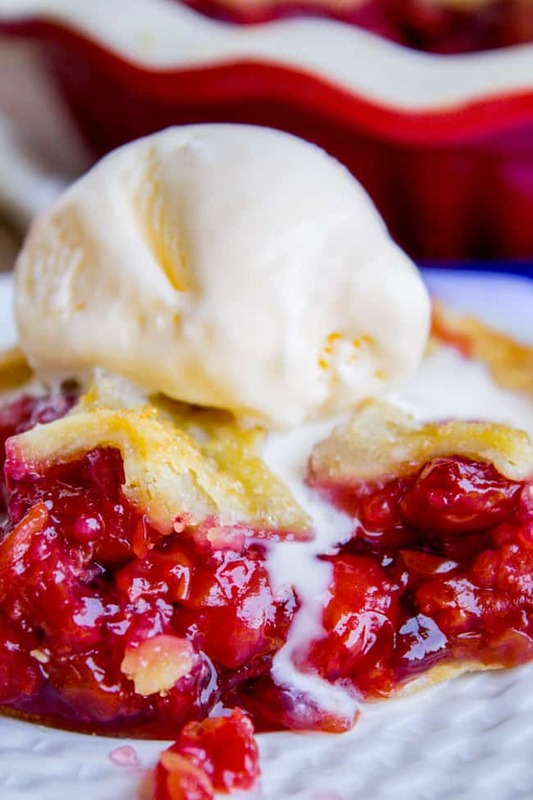 There is just something about June and July that says “It’s time to make cherry pie” :) Thanks so much for the comment and review of the recipe! I have a great idea. 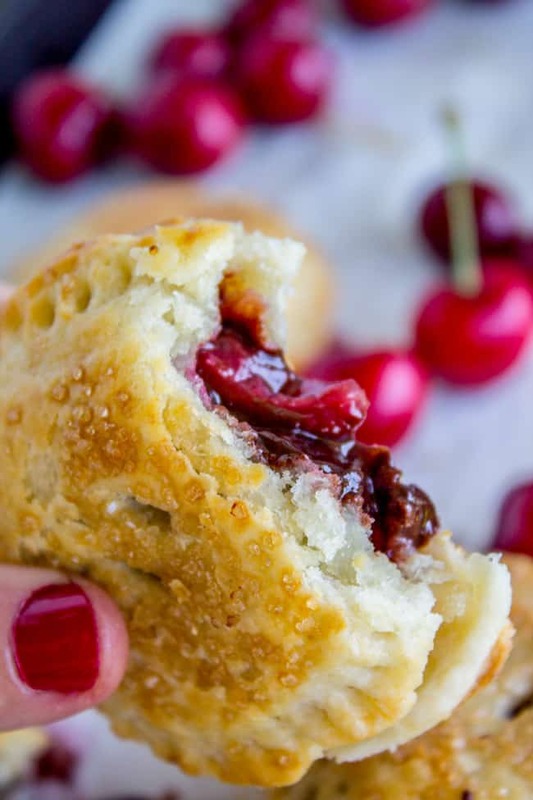 . . .you bring enough of those cherries from Trader Joes’ and we will make two of these pies! If you forget I’ll pick up the regular ones at the grocery store. Let’s DO THIS! !